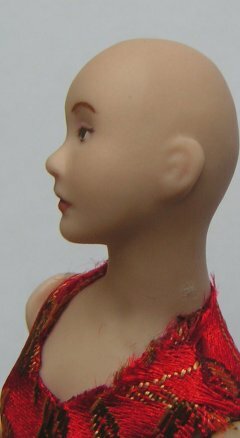 You will need fabric, tacky glue, toothpick, scissors, 1mm lacet trim, trim for skirt trim for headband, feathers and faux gems. 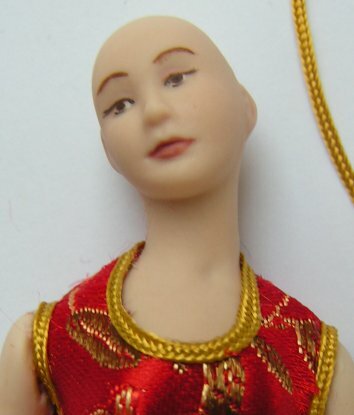 Choose your doll which should have full arms and if possible a fairly flat chest, this lady doesn't have any underwear as it will ruin the shape of the dress. Paint the shoes with acrylic paint and allow to dry. 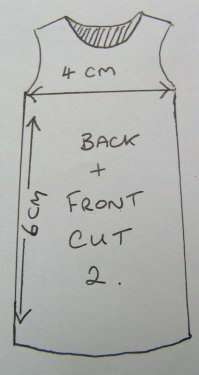 Cut out your pattern and fabric. 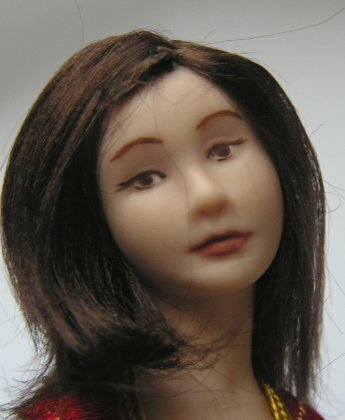 Glue seams together, remember to glue right sides together, DO NOT GLUE SHOULDERS, when dry turn inside out and press and try on doll. 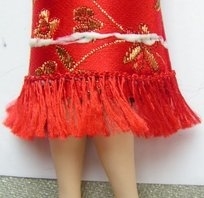 If the skirt needs to be shortened cut to desired length, remove from doll, fray check the hem and allow to dry. 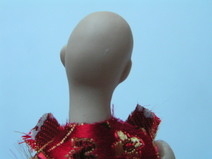 Put the dress back on the doll, apply glue to the back shoulders of the fabric and glue to doll. 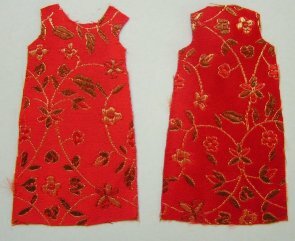 Then apply glue on the wrong side of the fabric on the front shoulders; fold over to neaten the edges and glue to back shoulders. 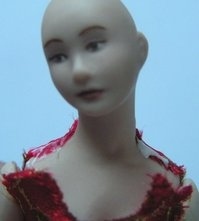 At this stage trim any excess around neckline with sharp scissors. Next place a tiny line of glue around the neckline and place lacet trim in place, do the same with the arms. Now we start on the trim for the skirt. Fray check the hemline and let dry. 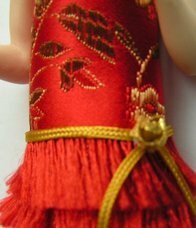 Working from the bottom upwards check the width of your trim and place it on the doll so that it hangs halfway below the end of the skirt. 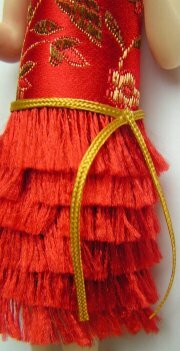 Place a fine line of glue around the bottom of the skirt and put trim in place. Gradually work upwards until the final piece of trim is on the hips. Remember to overlap halfway on the previous section. 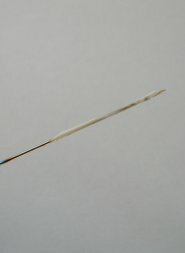 Glue some lacet trim around the final piece and add a bow or rose. 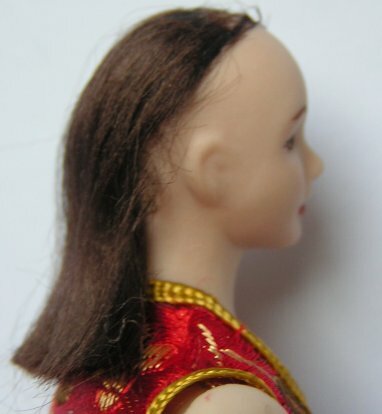 Glue some viscose hair to the back of your dolls head. 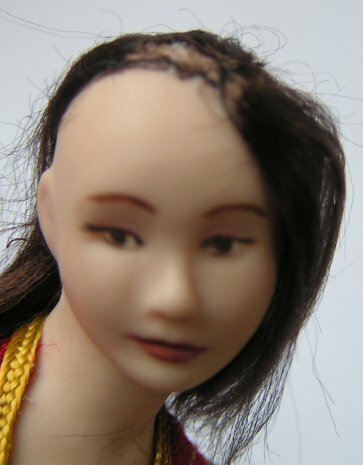 Then make two pieces of hair by using a large pin, run a thin line of glue along the pin, place the hair over the pin and fold together, make sure you have a tight hold on the hair and pull off, this will leave you with the look of a parting when placed on the doll. Practice this a couple of times if necessary it will be worth it. 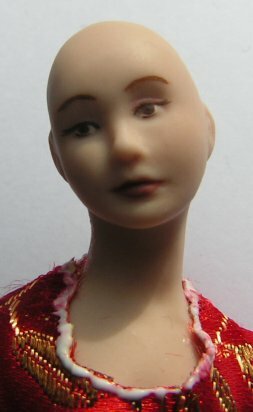 Next glue your partings on the top of the head of the doll, you may have to trim any excess. When dry comb out so that the back mixes in with the two sidepieces. 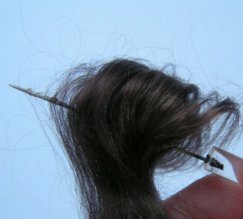 Trim the hair into the style with sharp scissors. 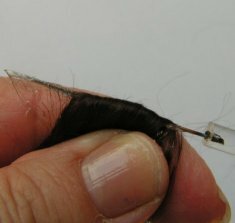 Place trim around the head and glue at the back. 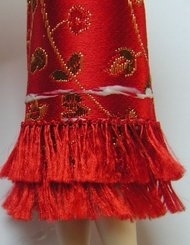 Add faux gems, necklace, stole and feathers if desired. 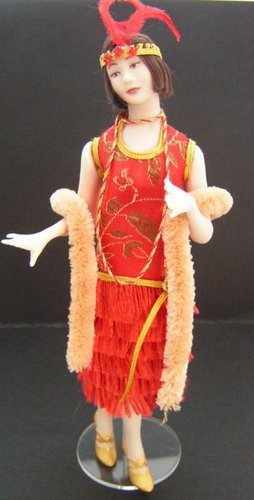 You should end up with a lovely 1920's Flapper like this.